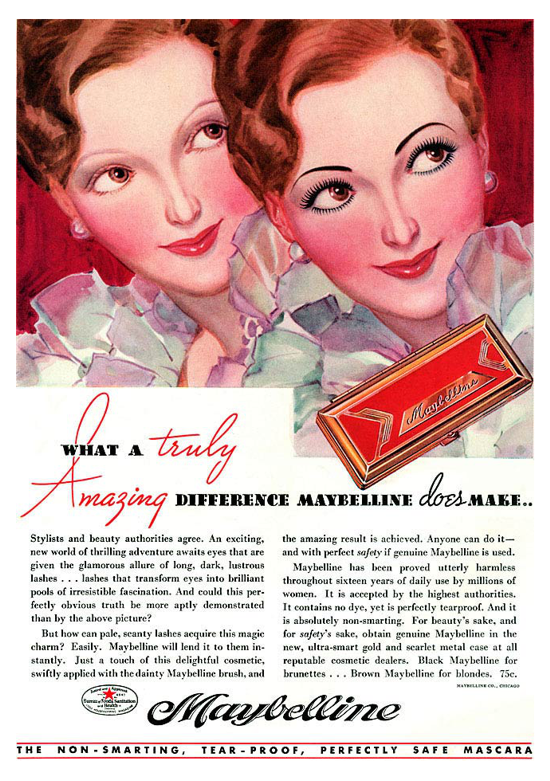 Features: The exact composition of the early Maybelline cake mascara is unknown, but it was most likely a sodium stearate cake mascara. 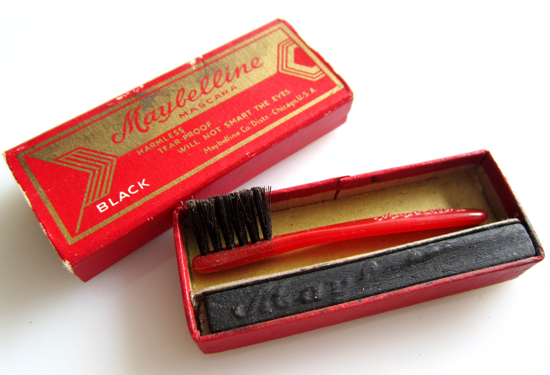 Maybelline came in two shades, black (containing lamp black) and brown (containing iron oxides). 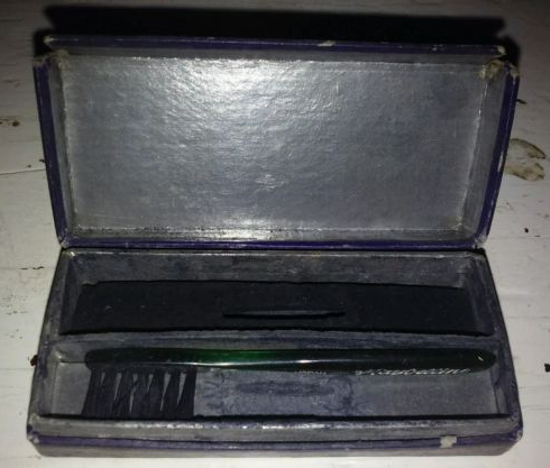 The box included a rectangular cake of product stamped with the name Maybelline, a small bristle brush and a mirror attached to the inside of the lid. The product was applied by first wetting the cake, then using a small brush to lift and apply the colour to the eyebrows and eyelashes. 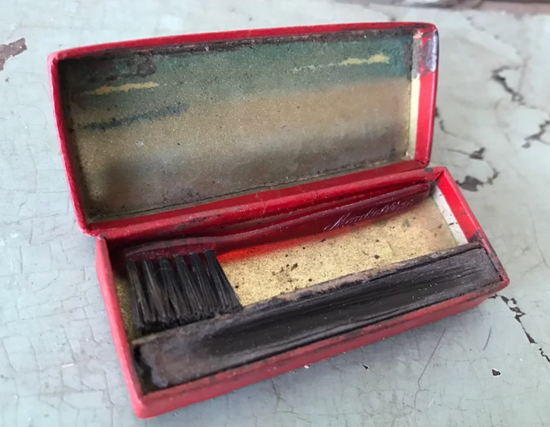 Interesting facts: Thomas Lyle Williams, a young entrepreneur from Chicago, noticed his older sister Mabel applying a mixture of Vaseline, ash and coal dust to her eyebrows to enhance her eyes. Inspired by the potential of her homespun solution, Thomas used a chemistry set to make a better one, but his first attempt was unsuccessful. So he commissioned Park-Davis, a wholesale drug manufacturing company, to make a suitable product for sale. 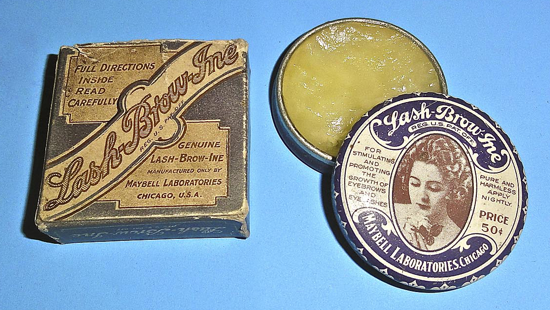 This first product was named "Lash-Brow-Ine". In 1915 Thomas Williams founded Maybell Laboratories - so named after his sister Mabel, and began to advertise and sell his invention as a mail-order product. 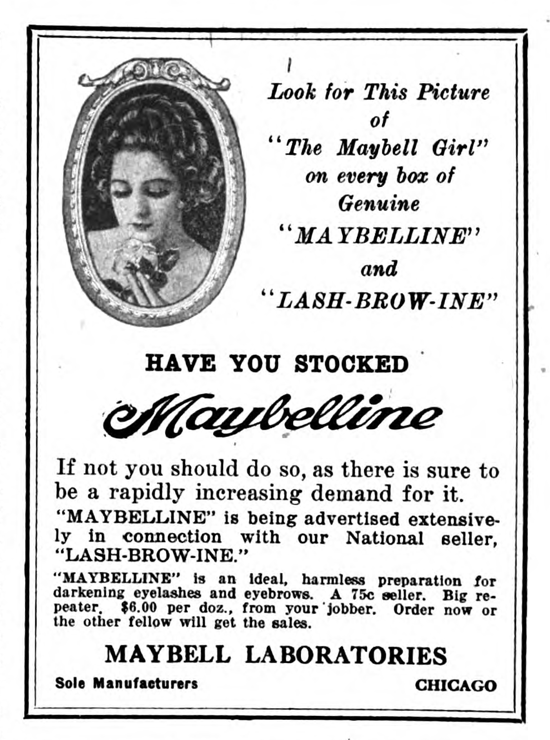 In 1917, with the assistance of Park-Davis, he began production and sale of a cake eyelash and eyebrow beautifier: this new product was named "Maybelline". 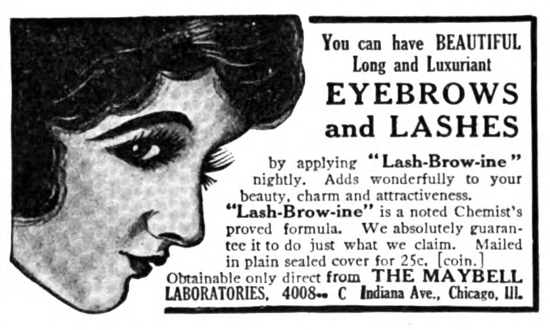 After losing a trademark dispute in 1920, Williams could no longer use the name Lash-Brow-Ine, and Maybelline took its place. In the 1920s promotion play an important role in the success of the company, with a lot of advertising featured famous actresses such as Phyllis Haver, Ethel Clayton, Viola Dana, Ruth Roland and Natalie Moorhead. 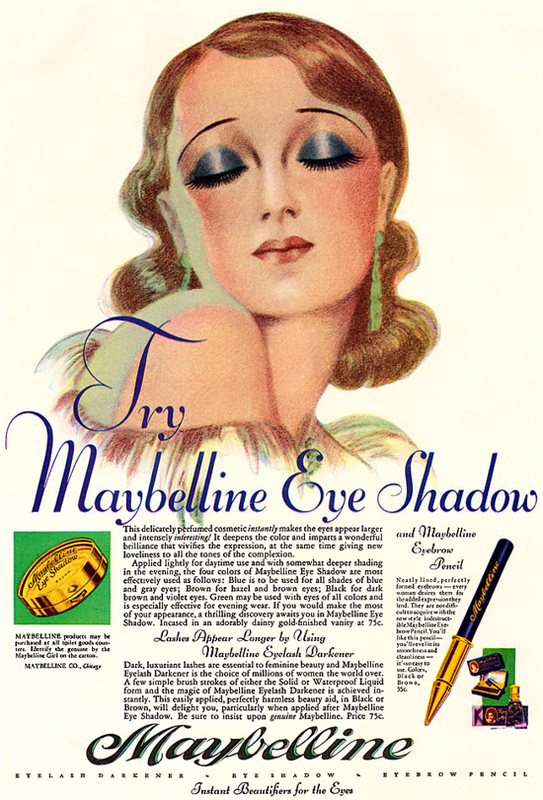 In the same years, the company expands beyond Maybelline cake mascara by adding a waterproof liquid version (1925), eyebrow pencils and eye shadow (1929). 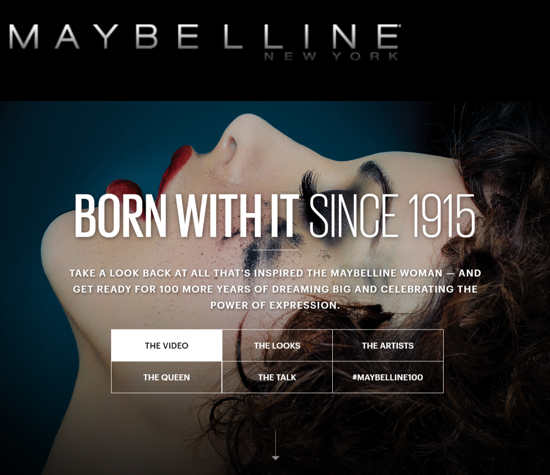 In 1996 the company was acquired by L'Oreal, and in 2001 became "Maybelline New York". 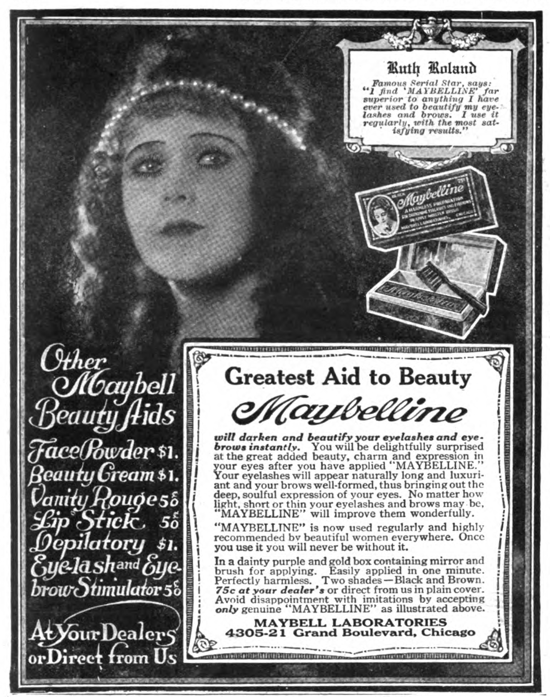 Maybelline, first packaging and first advertisement for "Lash-Brow-Ine", Maybell Laboratories' first product and precursor to Maybelline mascara (ad. from The Green Book Magazine, Chicago, Illinois, December 1915). 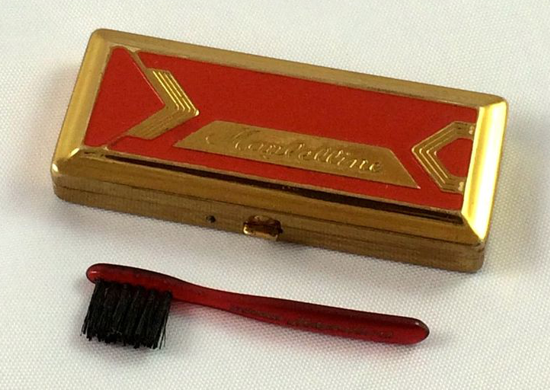 Maybelline, cake mascara 10-cent box (1932). 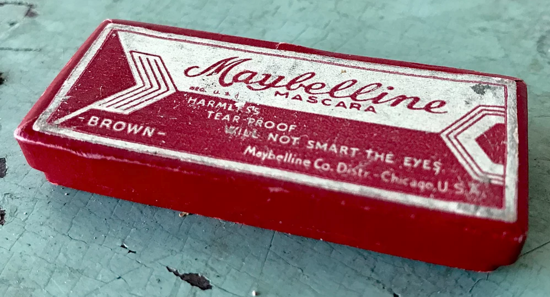 During the Great Depression, Maybelline introduced a special smaller version of the original 75-cent box of cake mascara. Maybelline, advertisement and packaging for cake mascara «in the new, ultrasmart gold and scarlet metal case» (ad. from Photoplay Magazine, New York City, April 1934). 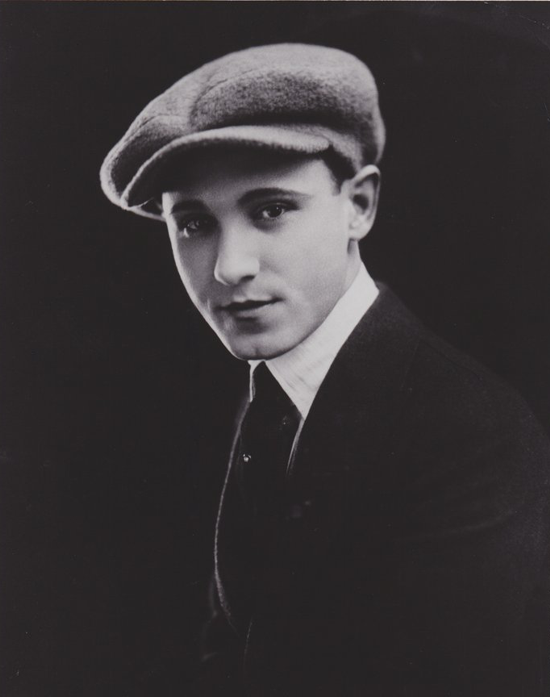 Thomas Lyle Williams (Morganfield, 1896 - Los Angeles, Sept. 26, 1976), inventor of Maybelline mascara and founder of Maybelline Laboratories.